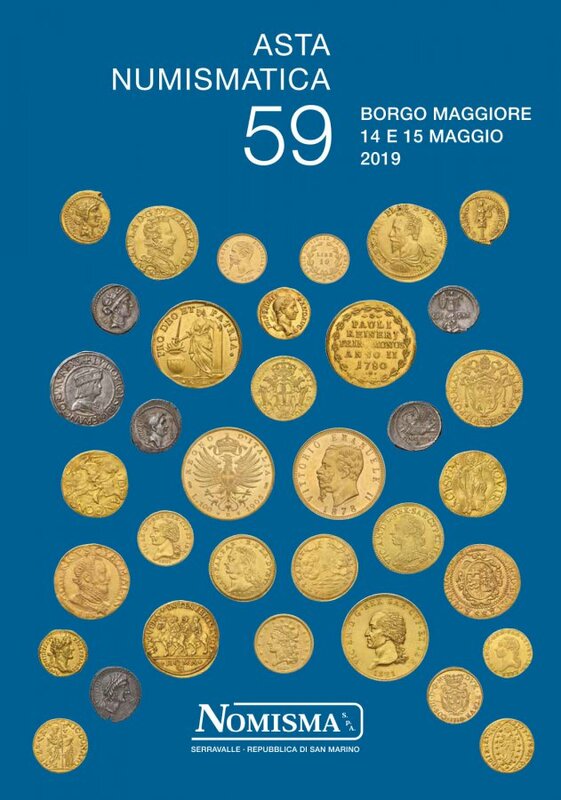 Numismatic Auction 59 NOMISMA S.p.A. Important: auction venue has changed! The sale is strictly for cash in Euro to the highest bidder. Nomisma who sells on behalf of a third parties with a regular sale commission. The description of lots, their condition and rarity, are a personal opinion, in any case, the lots can be examinated by customers in the day preceding the auction and in the day of the sale. No claim will be considered after the sale regarding condition, description and classification and for items composed with more coins. The authenticity of the coins is guaranteed and without defects unless otherwise stated. Any claim will be considered only if presented within 30 days after the sale (for the coins sent by mail will be considered the date of the postal office). After 30 days we are not responsible. For every claim, acknowledged within 30 days, our responsibility is limited to the sum paid by the the bidder. The sale opens at the estimated value. The buyers must add 18% to the last price realised as a premium for the sale. Every bidder present in the sale room or registered in website, if not known by Auctioneer, must be recommended. The Auctioneer can combine, divide or withdraw any lot and he can change the order of sale. If any dispute arises during the auction, the Auctioneer can put the lot again during the same session, starting from the last bid. Every bidder is direcly responsible for his purchases and he can’t claim that he acted for another person. The lots sold to bidders present in the sale room must be taken and paid within 24 hours. Property of lots is not transferred till full payment. The auctioneer can solve the contract if unpaid. Shipping to mail bidders will be executed only after the payment; the lots are mailed at the cost, risk and peril of the purchaser. Mailing is not insured for some countries (e.g. NOT in Germany, USA and Canada). Invoices not paid within 30 days will be added with a rate of 1% per month. Registered and insured mail will be sent abroad following the international rates and rules. Parcels will be sent at cost. The purchaser accepts to pay the customs duties. Please, note that the Republic of San Marino is not in the UE. Please note: we can not use FEDEX as shipping Courier. with insurance by courier in all Arab countries. In the case of customs document T2 emission, bidders have to pay in advance, as deposit, the customs import duties: the deposit will be returned as the T2 document will be closed. Bidders have to be aware of customs and shipping regulations before sending bids. At parity of value, mail bid will be preferred to the room bid. A bid to this auction implies total acceptance of these conditions. The italian text is the only autorithative, the translation being made only as an help for the bidder. For any dispute, the court of San Marino is competent. Please, register in our website nomisma.bidinside.com. Insurable privately to the limit of € 15.000 with deductible of € 500 or, for higher values, with courier-carrier, at the cost to be communicated. Assicurabile privatamente fino a € 15.000 con franchigia di 500 euro oppure, per valori superiori, spedizioni con corriere portavalori al costo da comunicare volta per volta.